Over here, we’re quietly obsessed with Ada “I Invented Computer Programming Before Computers Even Existed” Lovelace. Actually, we’re loudly obsessed- and frankly, why shouldn’t we be? Ada Lovelace is really pretty great. She’s got a society, and everything, and we couldn’t have a series about girls in tech without dedicating at least one blog just to her. Do you love her? You will when you’ve finished this article. The only legitimate child of poet/wiggy idiot Lord Byron, he reportedly sulked for days after she was born because she wasn’t “a glorious boy”- and didn’t attempt to gain custody of her after the divorce. Joke’s on you, Lord B- she was a glorious girl instead. Probably if she’d been a boy, Lord B would have wanted custody, and we’d have had some more damn poems, and no computers. HAVEN’T WE GOT ENOUGH POEMS NOW, BYRON? HAVEN’T WE? HAVEN’T WE? Anyone ever written a poem like that about you? No? Well, that’s because you’re not doing enough Maths. You thought only poets got the romance and the danger? Meet Ada, Ada, scandalous Ada. Not only was Charles Babbage, her co-inventor of the program, writing her poems like the above- but she had an adolescent affair with her tutor, kept a string of lovers and ran a gambling syndicate based on some shady algorithms she’d invented. She’s so brilliant. In 1844- literally almost 200 years ago- Ada was thinking about curing mental illness by working out where it came from, because she was worried about inheriting “madness” from Lord B. This “calculus” would be a mathematical model about how the brain gives rise to thoughts and feelings- something we’re still not sure of. Get on it, ladies, Walk in Ada’s footsteps. And do it while you’re listening to this music by Emily Howard, if you like loud and strange classical music based on mathematics. We can’t believe we’re still talking about this, but seriously- in the last ten years, we’ve had several books claiming that Ada was “mad”, “did nothing” and that she just piggybacked on the ideas of Charles Babbage. Which may be true- we don’t think it is, but you never know- but you don’t see people claiming that about male scientists. You really don’t. If science meant you had to stop dancing, nobody would do science. That’s just a fact. Still, when people think science, they think Dexter, shut in his lab- imagine if when we thought science, we thought Dee Dee. It’s genuinely possible both to save the world with your super brain and also be really keen on ballet, right? Yep. Ada knew it. Ada was a regular at court. Ada was “dainty”. Ada was “charming” AND “an original mathematical investigator…of first-rate eminence”. Yeah. YEAH. Ada, like lots of people at the time, took a keen interest in phrenology. For those of you not sure what that is, it’s deciding what someone’s personality is like, based on the bumps on their head, which indicate the size of the parts of the brain beneath. Dropped as a baby? Probably a criminal. Or something. Anyway, Ada thought this was pretty neat. And she was wrong. because even smart people are not immune to popular and nifty theories. It’s an important lesson to learn, because smart people will try very hard to tell you that just because they’re smart, you should trust everything they say. TRUST NO ONE, READERS. TRUST NO ONE. We ask everyone we interview how they got into tech- and we really, really wish we’d been able to ask Ada. Chiefly because the reason she got into Maths was because her mother thought it would cure any incipient mental illness waiting in the wings. And, to give her mother her due, it seems to have worked. Rigorous studying stops you having a “moody and unpredictable temperament”, apparently. You heard it here first. If Ada hadn’t also been a gifted linguist, she would never have been able to get involved with Babbage, and his proto-computer. Babbage asked her to translate an Italian article on his Analytical Engine, she wrote some comments on it, the comments ended up being three times longer than the piece itself, and the rest is history. Which is to say, start learning some old-school languages, wannabe programmers. Which isn’t totally true, to be honest (we told you to trust no-one)- but it’s certainly true of Ada. Ill for a lot of her life, with a range of ailments that’d put to shame the The Thackery T. Lambshead Pocket Guide To Eccentric & Discredited Diseases- she finally succummbed to uterine cancer at the age of 37, and was buried next to her estranged father. Poor Ada. Let’s just take a tiny second out of our ordinary days to think about how much more she might have changed the world. Wasn’t she brilliant? Haven’t we learned lots? 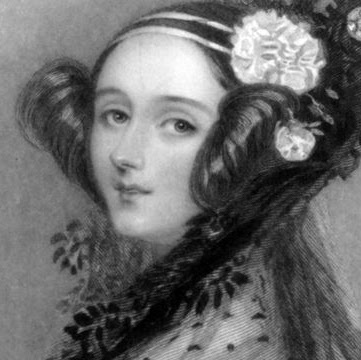 Ada, Countess of Lovelace, you were supremely excellent. This blog is part of Enternships’ Women In Tech series, within our ongoing commitment to supporting ladies who work in STEM sectors. Want to be involved? Email [email protected] for more information.